The Varilite Reflex Cushion is the best choice for wheelchair users who are at low to medium risk from pressure sores. 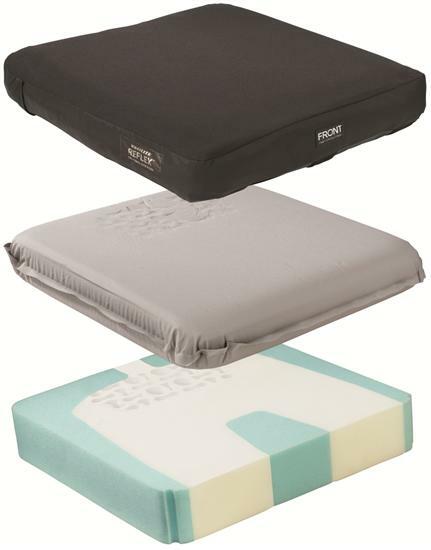 Its effective, ultra-lightweight designed, low maintenance cushion features a built-in Air-Release Device which automatically releases a portion of air when the user sits on the cushion which helps distributes weight evenly and offers additional comfort and stability. When weight is taken off of the cushion, the Varilite Reflex automatically re-inflates. With its fully waterproof cover it is easily washable in machine and is the obvious choice of wheel chair cushion for use within a hospital or clinical environment.